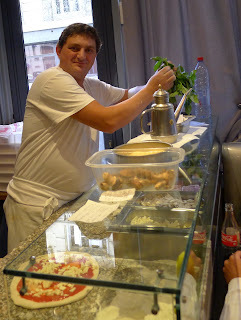 The gold standard that I use to measure pizza is a little place in Amalfi, Italy called Ristorante Pizzeria il Teatro. Tucked away in one of those narrow Italian passages, it turns out some heavenly pizza that spoils you for all other pizza. When Stéphane and I stopped by on a third consecutive night to order take-out pizzas to eat on the beach a few years ago, we asked the owner the secret to his amazing pizza. Evidently, other Il Teatro pizza addicts had asked him this question before because he patiently explained that pizza made in other parts of the world will never equal real Italian pizza because the primary ingredients for the crust, the water and the flour, aren't the same as in Italy. He must be right because few pizza crusts have ever managed to even come close to that of Il Teatro's. Nevertheless, I'm always willing to continue my quest for good pizza, so I readily agreed to try a restaurant that one of Stèphane's Italian colleagues declared to be the only real Italian restaurant in Paris. I'm glad that we're still not on the Parisian schedule for dinner because the restaurant wasn't full when we arrived around 7:30 p.m. on Saturday evening, which made it easier to take pictures of the man, whom I'm going to refer to as Alberto, in action. Most of the other diners were regulars who joined in with jokes and witty repartee when Alberto told me that I had to be sure to get the Italian picture that was hanging on the wall and the fresh basil in the photo to prove that he is a real Italian and not some sort of French-Italian hybrid. By the time that Alberto told me that he was going to make my pizza on a heart-shaped crust, I was under the spell of his winning ways and his Italian charm. I just hoped that the pizza would be as good as his banter. 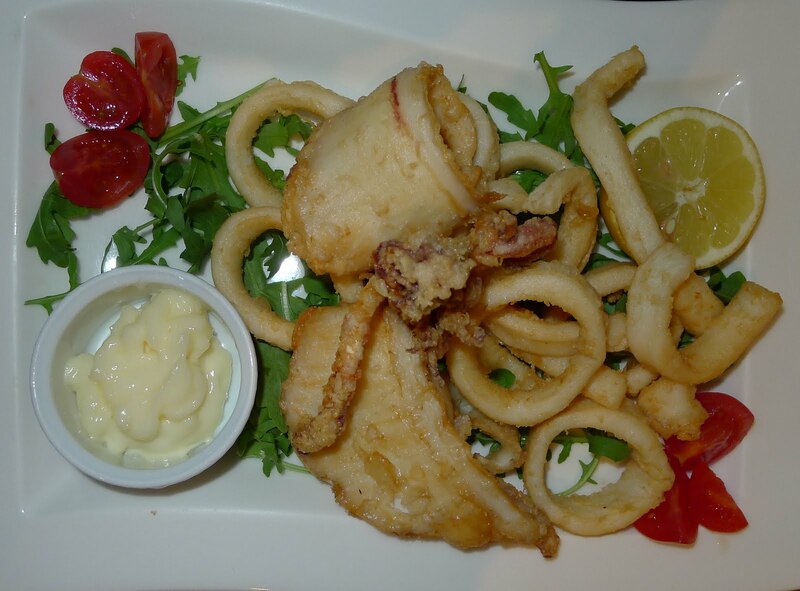 Stéphane and I started with some fried calamari that was lightly battered and cooked to perfection. The word for calamari in Indonesian is pronounced chumi-chumi, which is what it feels like in your mouth if it is poorly cooked and rubbery. Fortunately, this wasn't the case. I was a bit worried when my pizza arrived that I wouldn't be able to fully appreciate it after the calamari, but the crust was light and the toppings were fresh. Somehow, without having the water and flour of Italy at his disposal, Alberto came pretty darn close to matching the illusive Il Teatro pizza. Admittedly, I haven't had the opportunity to try all of the Italian restaurants in Paris, but for the time being I'm ready to agree with Stephane's Italian colleague. Oh, I almost forgot to mention that while Stéphane's penne al arrabiata was good, my pizza was the star of the evening. In honor of some tasty pizza, here's a YouTube clip of one of my favorite Italian songs, L'Italiano. If you haven't heard it before, please listen to it because it's one of those songs that transports you to Italy. Bon voyage! Mmmmm, my mouth is watering just looking at these pictures! I will definitely be trying this restaurant next time I am in Paris. You're welcome - And the pizza tasted just as good as it looks in the photos. After having tested Alberto's pizza last night together with Mary Kay, I can honestly give testimony to the deliciousness of it. We also shared a plate of antipasto for starters and it was equally divine! Not to mention the Nero d'Avola (Sicilian red wine) that went very well with our food and the excellent espresso that perfectly finished off my meal... Unfortunately, there was no room for desserts - I'm going to have to go back with my husband to try those as well (he happens to be a Pâtissier). Forza, Alberto, e buona fortuna per la sua ristorante napoletana!! Selamat Datang and thanks for leaving a comment, Asti! After spending 5 wonderful years in Surabaya, we really did feel as if Indonesia was home and were very sad to leave. Some expat friends of ours were visiting this weekend and we had a great time talking about our days together in Surabaya. And, of course, we talked about how we wish that we could have some real Indonesian food - I'll trade you a pizza from Da Alberto for some nasi goreng and soto ayam!